3 Tips to Preventing Ingrown Toenails Ingrown toenails can be very painful! They are easy to prevent with some simple steps. Dr. Brad Schaeffer discusses 3 easy tips to preventing ingrown toenails. If you have an ingrown toenail, you can relate when I say the pain and discomfort is beyond aggravating. Trying to find comfortable shoes is sometime impossible. But what do you do about an ingrown toenail? Do you try to cut it out with a toenail clipper? Will it be there forever? Some people are scared to seek medical attention because they think they will have to get their nail removed. Though sometimes this is necessary, it is rare that it one will have to lose their entire nail. 1. 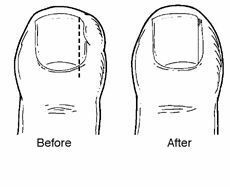 Proper Toenail Clipping- you need to properly cut your toenails in order to prevent ingrown toenails. This is the most common reason people develop ingrowns. You are always supposed to cut your nails straight across- never cut the edges on a curve! 2. Proper Fitting Shoes- shoes that are too tight on your feet, especially around the toes may cause painful ingrown toenails. Make sure your feet fit comfortably in the shoes. When you, or a professional, measure your feet for shoes make sure to measure the length as well as the width. Your shoe size will be the larger of the two.